OK – you've got time for one pun. John loves puns. The Greek verb in vs. 5b means either "comprehend" or "physically overcome," depending on the context. My favorite translation of this verse has "grasp," which means exactly the same thing, depending on the context. Most translations choose one or the other of the meanings. So many people were going out to hear John and to be baptized by him that the religious authorities decided they needed to know what was going on. They wanted to know if he claimed to be the Messiah or, as they no doubt had heard, a new version of either Elijah or Moses ("the Prophet"). He said no; Jesus later said yes. One thing I like about the Gospel of John is the little, irrelevant details. John is giving us this beautiful, poetic message about the light of the world and the messenger sent from God, and then all of a sudden, "This happened in Bethany on the other side of the Jordan." It doesn't really matter to the story, which convinces me that it is the true memory of an eye witness. The disciples of Jesus were a mixed group, called at various times from various walks of life. We also see in the gospels what seem to be conflicting accounts of when and where some of them were called. I have no problem with this. Were you called to your job when you heard about the opening, were invited to an interview, or were offered the position? Were you called to your marriage when you met your spouse, got engaged, or said, "I do"? Today we see that two of the earliest disciples, X and Andrew, were previously disciples of John the Baptist. Charles R. Erdman notes that the first four disciples named came to Jesus in four different ways: Andrew through the testimony of his teacher John the Baptist; Peter through the witness of his brother Andrew; Philip in response to a direct call from Jesus (1:43), and Nathaniel in a spirit of honest but skeptical inquiry (1:46). X is usually thought to be John the disciple, who never mentions his own name in this gospel, and whom we know to be an early follower. John typically provides a lot of minor eye-witness details, so his failure to give a name here is best explained by its being his own name. It's so complicated that only I, in my superiority to you, can understand it. Therefore you must do as I say. It's so complicated that nobody can understand it, therefore I can do whatever I want. God had set up a very simple system for dealing with sin—Sin is a matter of life and death; if you sin, you pay for it in blood. There were some details about what kinds of animals provided acceptable blood, but this was the basic system, and it was easy to understand. By the time Jesus lived on earth, the religious leaders had made the system very complicated. If you sinned, you still had to pay, but your animal had to be inspected by them. If they didn't approve of it, you had to purchase a new animal that was acceptable to them. You had to use money that was acceptable to them to purchase your new animal. If you didn't have acceptable money, you had to buy acceptable money. What was acceptable to God had become less important than what was acceptable to the religious leaders. Jesus said, "OUT! This new system is unacceptable!" Paul said, "God's message is so wise that people who think they are smart can't understand it, but for anyone who truly wants to understand it, it's simple." God's new system is even simpler than his old system: if you sin, Jesus has already paid for it in blood. All you have to do is pick up the receipt. See also 1 Corinthians 1:18-25. Our passage for today is so rich that no matter what I say, I'll leave out at least 16 important points. The Pharisees were the really well-educated, religious people in Judah. Nicodemus was a leader of the Pharisees. Jesus expected him to be able to understand what he was hearing. But as well-educated, religious people ourselves, we know that sometimes what we know gets in the way of learning something new. Nicodemus had the same problem. Another problem was that while he wanted to visit Jesus, he didn't want anyone to know about it – that's why he came at night. No matter how you get your news, you know you can probably believe it if it's "eye witness news." Jesus told Nicodemus, "I'm giving you eye-witness news about stuff you already know, and you don't understand it. How can I teach you anything new?" And what's with the snake? Back in the desert, the Israelites were (as usual) complaining about God, and they got struck with a plague of poisonous snakes (Numbers 21:4-9). God told Moses to make a snake out of bronze and put it up on a pole for the people to look at so that they could be cured. This is almost universally taken in the Church to be a foreshadowing of our salvation from the plague of sin by the lifting up of Jesus on the cross. Finally, note that some translations end the quotation from Jesus with vs. 13. Most modern scholars accept this, and attribute 14-17 to John's commentary on what Jesus was saying. A lot of people believe instead that Jesus personally said John 3:16-17. The Greek text of the Bible doesn't have ending quotation marks, so whatever anyone wants to think about that is okay with me. Do you like puns? Do you know the story about the old cattle rancher who turned the operation over to his boys and renamed the spread "Focus"? When his friends asked why, he said, "Because this is where the sons raise meat." The disciple John loved puns, and today's scripture records a great three-word pun from Jesus in vs. 8. In Greek, three words have more than one meaning. Pneuma means wind or spirit. Pnei means blows (for wind) or breathes out (for persons). Phonen means sound or voice. (Several other words mean either it or he.) So verse 8 can be translated with equal accuracy in two ways. The wind blows where it wishes, and you hear its sound, but you do not know where it comes from or where it goes. The Spirit breathes out where he wishes, and you hear his voice, but you do not know where he comes from or where he goes. Nicodemus didn't get it, and neither do we, but at least we have the excuse that we don't speak Greek. Maybe Nicodemus was pun-impaired. Mostly we can't even see the pun in English – I looked at 8 translations, and all of them translate pneuma as wind in the first half of the verse and Spirit in the second half. Three point out in the footnotes that the Greek word is the same for both. None of the eight mention blow/breathe or sound/voice. Have I mentioned lately that you need a good modern translation with study notes? Sometimes I wish I knew a lot more about Greek (without the necessity of taking more classes). The Greek word pneuma is used 350 times in the New Testament. It is translated "spirit" or "Ghost" (as in Holy Ghost) 349 times in the King James Version. Once, it is translated "wind" (John 3:8). What is up with that? Phonay is used 129 times; 119 times it is translated as "voice"; 8 times (once in John 3:8) as "sound"; and twice as "noise." I've said before that John seems to love puns and that 3:8 is a great multi-word pun. Is Jesus talking about the voice of the Spirit, or the sound of the wind? Yes. What you hear depends on whether your ears have been born of the Spirit. Both of the scripture passages for today contrast physical food and water with heavenly food and water. 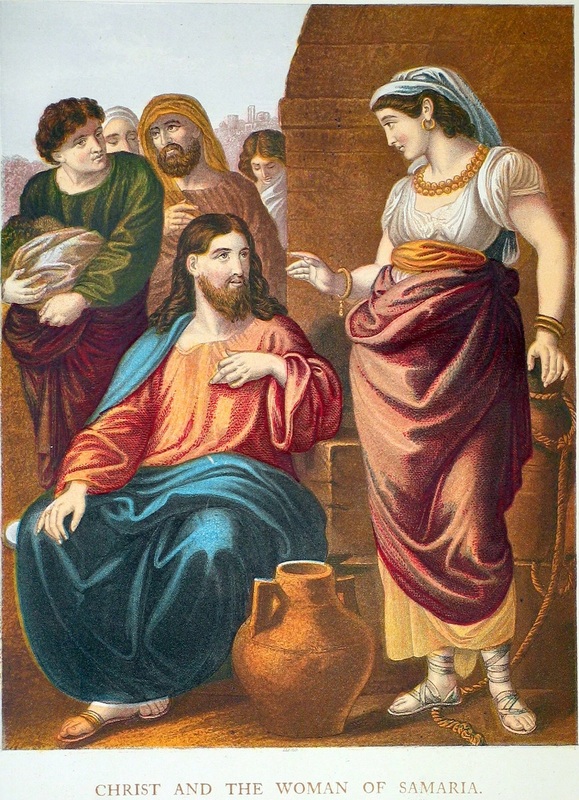 I like this Samaritan woman: she is a sharp cookie. The first thing she asks Jesus is, "You are a Jewish man. I'm a Samaritan woman. I know that Jews don't talk to Samaritans, and Jewish men don't talk even to Jewish women in public. What gives?" The second thing she says is, "Oh, right. You are going to give me water? You don't even have a bucket!" Satisfied with the answers, and impressed that he has discerned that the man she's living with is not her husband, she immediately concludes that Jesus is a prophet, and she asks him a theological question: "My ancestors, Abraham and Jacob, worshipped on this mountain. How is it that you Jews, who are also children of Abraham and Jacob, say that this is unacceptable?" Finally she comes to the most important question: "So what's the story on the Messiah?" When she hears the answer, she runs to get her friends. Because of her spiritual discernment and her willingness to pursue heavenly food and water, many people of her town are saved. As Isaiah says, "You will call out to nations you have never known. And they have never known you, but they will come running because I am the LORD, the holy God of Israel, and I have honored you." My youngest granddaughter is 4 1/2 years old. Sometimes she says things that are so mature, so adult, that I am just amazed. The Samaritan woman was equally amazing. When Jesus struck up a conversation with her, at first she was surprised, because Jews normally didn't talk to Samaritans or deal with them in any way. Furthermore, although you can't see it in this translation, she's surprised that this Jewish man is speaking to a woman. But when they talk a little longer, she has a spiritually mature insight: Jesus is a prophet. Immediately she starts asking him some fairly profound theological questions, and the answers she gets suggest to her something even more insightful: perhaps this is the Messiah! She should tell all her friends! Remember Nicodemus? He was a teacher in Israel, supposedly a spiritual adult, but he didn't get it. The Samaritan woman was supposedly a spiritual child – even less than a child, one who could not be expected to understand – and she got it right away. Aren't you just amazed? Remember some time back we discussed the difference between the book of John and the Synoptic Gospels (Mathew, Mark, and Luke)? John wrote his gospel several decades after the other gospels were written, and the Church specifically asked him to fill in some gaps. In many places, the Synoptic Gospels cover the same material, and in some places they are virtually identical. In contrast, there is relatively little overlap between John and the Synoptics. In the Greek New Testament and most translations, John 6:1 begins, "After this" or "After these things." John Wesley pointed out that the events of 10 or 11 months can be supplied from the other gospels to fill in the time that John describes with "after this" (Mat. 14:13, Mark 6:32, and Luke 9:10). The miracle of the loaves and fishes, however, is attested in all four gospels. The gospel of John, in contrast to the Synoptic Gospels, contains almost no parables and many metaphors. The sayings "I am the resurrection and the life," "I am the way, the truth, and the life," "I am the door of the sheepfold," "I am the good shepherd," and today, "I am the bread of life" all come from John's gospel. Shortly after he has fed several thousand people with five loaves and a couple of fish, some skeptics ask him to produce bread for them, just as God produced manna for their ancestors. They understand neither the miracle he has already worked nor what he has already said. He explains that he himself is the true "bread of life." Copyright 2007, 2008, 2009, 2010, 2013 by Regina L. Hunter. All rights reserved. The illustration showing Christ and the Woman of Samaria is from the Binns family Bible, now in the private collection of Regina Hunter.